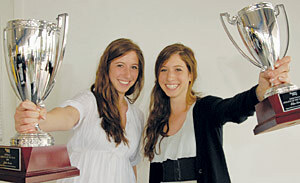 Julie Kovac and her sister Elise have always had something of a sibling rivalry. The longstanding one-upmanship between the sisters drives each to be better, Julie says, which made conversation around the dinner table last Thursday interesting. That morning, Elise was named the Vaughan Today Senior Female Athlete of the Year at the second annual award ceremony at Roy Foss Chevrolet in Woodbridge, giving Elise bragging rights. Julie edged out her sister for the top award, taking home the Overall Winner trophy. “I was shocked because we’re pretty much the exact same, so when she won the Senior Athlete, I was really happy for her but I didn’t expect to win the Overall,” Julie said Monday. “We’re best friends but we’ve always been competing … and I think that motivates us to do better. The grade 12 Tanenbaum CHAT student was chosen from 50 finalists to be named the city’s top student-athlete. Julie starred on five school teams during her high school career: flag football, soccer, basketball, and both girls and co-ed volleyball. The honour roll student began her athletic career after watching older brother David on the soccer pitch. “I went to see his games and I really liked it,” Julie said. “I liked watching it, it looked exciting. She wound up playing the sport competitively outside of school. And she got pretty good at it: she was named MVP in the St. Jean de Brebeuf invitational soccer tournament and made the City of Vaughan varsity girls all-star team in 2007, ’08 and ’09. Despite that success, Julie said soccer isn’t her best sport these days. She led CHAT’s varsity girls basketball squad to a Tier 2 championship a year ago and to the Tier 1 semi-finals this year. “Our school isn’t too athletic, not many people play sports, so it was a big deal for us (to reach Tier 1) and we still did really well,” she said. Her trophy case also includes tournament MVP honours in the Becker and Houston basketball tourneys in both 2008 and 2009. Julie stays busy off the court, too. She was in the school’s production of Oliver this year and worked on CHAT’s yearbook. With high school over, Julie is looking forward to attending the University of Western Ontario in the fall, where she plans to study business — and maybe even shoot some hoops. Wherever her sports career leads her, athletics will always be a part of her life, Julie said.